DELAGE (Grand Prix Race Car): Postcard, 4x6. 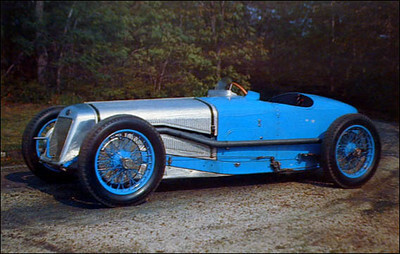 Front of card is photograph showing three-quarter frontal view of blue and silver Delage Grand Prix race car, parked in outdoor setting. Reverse side has brief description and is unused. Postcard was produced and sold by the Briggs Cunningham Automotive Museum from a car in the collection. I.D. #37635. Copyright 1972.